Classic gets a modern makeover; Erwin Termaat brings the timeless flip clock paradigm into modernity, while losing none of its simplicity and beauty. Leff Brick alarm Clock it’s a premium and indeed heavyweight item, around 14″ across and made of stainless steel, with a ‘silent’ Japanese Quartz Movement inside. But that’s only half the table, the stainless steel case is hand welded and brushed which gives this clock a unique touch of top notch craftsmanship. You can hang in on a wall or put it on a desk. 2 x D Batteries Included. 5-year warranty. Classic gets a modern makeover; Erwin Termaat brings the timeless flip clock paradigm into modernity, while losing none of its simplicity and beauty. 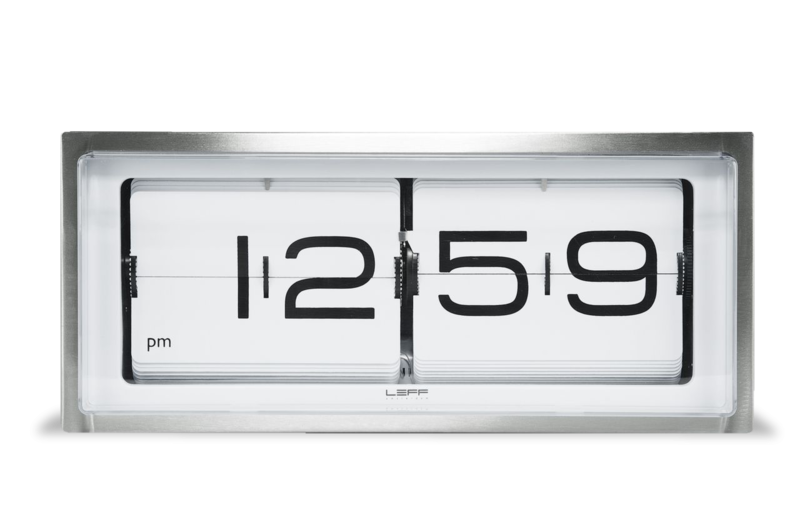 Leff Brick alarm Clock it’s a premium and indeed heavyweight item, around 14″ across and made of stainless steel, with a ‘silent’ Japanese Quartz Movement inside. But that’s only half the table, the stainless steel case is hand welded and brushed which gives this clock a unique touch of top notch craftsmanship. 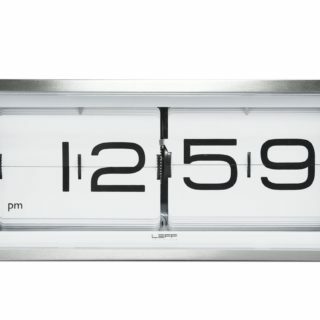 This clock can be displayed on a desk or hung to the wall.. Size: 14.2" x 6.2" x 12.8"
Any movement or production defects are covered by a 5-year limited warranty. Each clock comes with a service pack, which includes a cleaning cloth, battery and mounting screw.